For those of you who know me better, I'm not the type who likes to make extravagant meals for myself to try new food, but I do like to enjoy going out around the city and trying new dishes at interesting restaurants. Today happened to be no exception. After finishing a day at college, my friend Katie decided to show Natasha and I this sushi restaurant that she absolutely loved. Let's be clear for this quick second...I've only had sushi once and it was at Mandarin so I'm no expert on this cuisine. 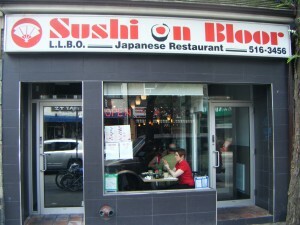 The place was called "Sushi On Bloor" and I was expecting the worst before I even set foot in to the place. I was quickly proven wrong on many occasions throughout the lunch so you'll be happy to know I loved the experience dining at this restaurant. The first thing that surprised me was that there was a big line for a small restaurant and how quickly people were seated to their tables. The decor in the place was comfy in a modern-meets-casual sort of way; it had the low-key yet extravagant artsy feel of what you'd find in the Annex. The menu was well-stocked with a variety of selections and great deals if you wanted to order off the lunch menu. Natasha and I made the same mistake for first time visitors when we ordered: we each got two dishes off the lunch menu and didn't realize how much we actually ordered. We expected that there would be a smaller quantity of items and that it was just the chicken but we were proven wrong. For a great price at what we ordered, we got a lot of quality food to eat. I'm not the greatest fan of sushi but the dish was amazing. The chicken was cooked just right, the sushi was surprisingly delicious, the soup was tasty and the salad was great. It takes a lot to change my opinion, especially about food, and I'm really glad that I gave this place a try. I'd definitely recommend the dynamite rolls to start off with for the sushi. The kani rolls are really good too if you're in to crab. If you decide to get an order from the lunch menu, be prepared to know that you'll get some pieces of sushi already; we didn't realize this and ended up with A LOT of sushi rolls leftover after the lunch was done. Poor Katie had to doggy bag the leftovers and brought them home to her mom. 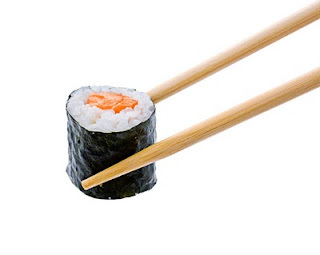 If any of you are near Toronto's Bathurst and Bloor section in the Annex, check out Sushi on Bloor. It's only less than two blocks away from the main intersection and it's worth checking out. Be prepared to wait for a table around the lunch rush because, surprisingly, it is a popular place but the wait is really quick and you will enjoy the food so much.